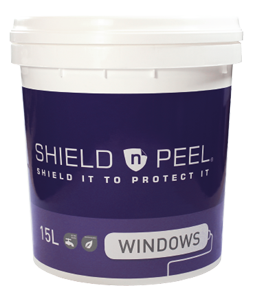 SHIELD n PEEL for WINDOWS delivers a temporary surface protection to most non-porous surfaces. It protects against possible damage caused by cement, paint or render spatter, welding and grinding flecks as well as other damage caused during the building, renovating and cleaning process. 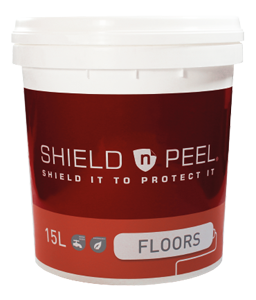 SHIELD n PEEL FLOORS delivers a temporary surface protection for floors. It protects floors from build up of inks, spray-track adhesives, paint tracks, lint, grease, oil spills and grime. When it is time to clean, just peel it up. Designed especially for floors, it has a built in traction allowing you to walk on it and avoid slippage. 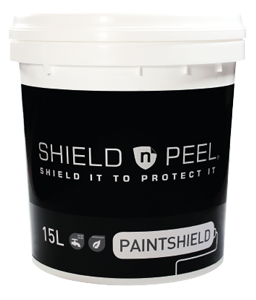 SHIELD n PEEL PAINTSHIELD is a water-based clear peelable coating formulated to protect your automotive finish. It is simple to apply, easy to remove and leaves no sticky residue. It cures upon water evaporation, leaving a protective clear coating. The coating has no solvents to damage the car surface. 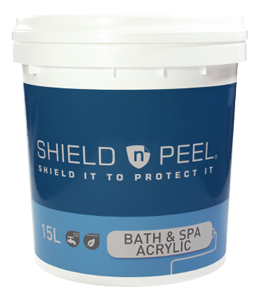 SHIELD n PEEL BATH & SPA ACRYLIC virtually eliminates tub repairs and reduces clean up costs. It’s a water-based peelable coating that is applied onto the bathroom fixture, drying to form a durable temporary coating that protects the fixture from damage during the construction or renovation phase.